Who’s with me – I declare 2017 the year I finally conquer clutter! My goal: 15 minutes a day spent decluttering and filling one bag a day to donate or toss. While 15 minutes may not sound like much, think of it like this. 15 minutes x 365 days = 5,475 minutes = 91.25 hours. 1 bag a day = 365 bags of useless things cluttering up our lives. Let’s get organized together. Let’s be able to find things instead of constantly searching through piles of stuff. Let’s surround ourselves with things we love and that make us happy. Let’s let go of all the rest. Read my Decluttering Tips if you don’t know where to begin. I confess that I haven’t kept up with it that’s why I started this challenge and would love you to join me. 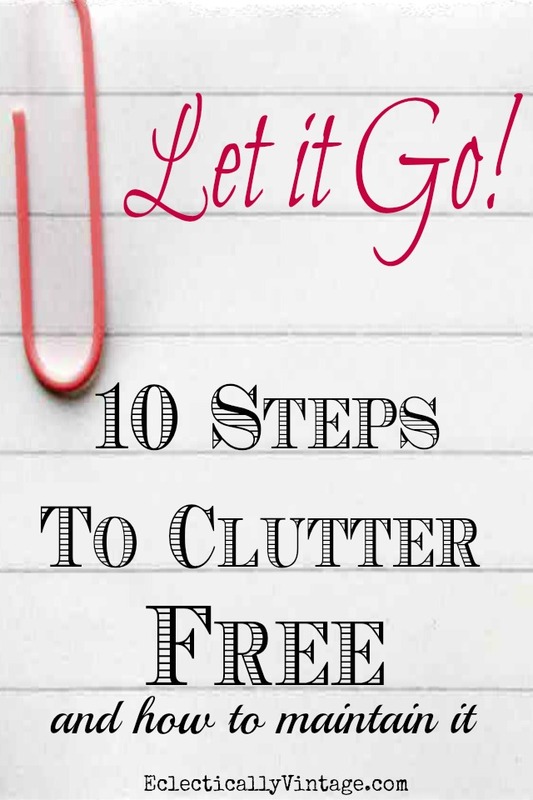 Join my Conquer the Clutter Challenge page on Facebook – a community to support each other in our mission to declutter! This is not about organizing – this is about clearing out the clutter! Organizing will come later and be easier once we pare down our belongings. We are all busy but I know we all have 15 minutes a day to devote to living a better life. Coming from a self professed hoarder, I know how hard it is to part with stuff. But as I get older, I am definitely all about letting go and surrounding myself with only things I actually use and love. This is a daily process that will hopefully turn into a habit that gets easier and easier as the bags get smaller and smaller. I started with my girls sock drawers and filled a shopping bag with holey socks and size 6 kids underwear (my girls are 17)! Be brutal when going through those drawers, cabinets, closets, garages, attics and every other nook and cranny. What are you going to fill your first bag with? When I was prego with first child I had this incredible urge to put everything in my house in order. I learned it was a nesting instinct, let go of what you don’t actually love and use. Two years later I got the same urge, ooo I must be prego again. yep, and so I continue the first of each year going through every closet, drawer, cubby and putting everything cleaned and in its rightful spot. Many things go into the donate bag. Still because I love all the stuff in my house, lots of it stayed in my house. This year I am keeping only things I actually use and only about 10 percent of the things I truly love. I started in November this year and already I am thrilled with my house, it has a new freedom and happiness. Wish everyone success with this challenge. Happy New Year!! Yes, I remember nesting and painting and organizing when I was pregnant. Maybe I need to get pregnant again!! I can’t wait to get to the point where I know exactly what I have and where everything is – good for you! ha! my husband is bringing up the totes of snowmen as we speak. i am going through them and keeping a few to decorate the sun porch fireplace mantle (we have young grandchickies), then donating the rest. oops! they’re ready to sort! gotta go! lol. I have so much Christmas stuff! I don’t use 2/3 of it – I need to go through and donate. Enjoy the snowmen you keep and your grandchickies! Unlike Liz Thomas, I won’t be able to get pregnant so that I can throw stuff out. I’ll toss all those old binkies and diaper genies! Happy New Year Kelly!….I am joining you in the challenge. Especially when we are seriously talking about downsizing! Great Shirley! I think about what I would have to go through if we ever moved! My friend just downsized and on the day of the move, she was putting ads on Craigslist for her free stuff! She just wanted it out – and it was hard to get rid of on such short notice. We can do this! I am with you! I have always been a collector…I’m like a magpie….. ooooh, something shiny! Can’t throw out anything…. what if I need that ? But I am finding it easier these days to toss that wire tie from the bread bag, and not throw it in the junk drawer. I’m getting better. First, I’m not bringing home what I used to. I’m more particular, or I just leave it on the shelf for someone else. I LOVE thrift stores and curb shopping, but I know I don’t have the room for one more project. So, now at least if I find something beside the road I DO have a way to re-home it. It is going to the Center for Refugee Services. Families are coming here with nothing, and that table and chairs I just saw in the garbage can be cleaned up for them! But getting rid of clutter in my house must continue. I didn’t get as much done this year as I had planned when I made the new year’s resolution last January. I need to get back into my closet and pull out all the stuff I’m not wearing. I still have suits and blouses that I used to wear at my last professional job. That was 11 years ago. Need to go through the file cabinet and toss old invoices and Instructions for items we no longer use or own. Time to go through the spare room and get rid of craft stuff I no longer take an interest in. I have plenty to do ! Thanks for a shove in the right direction ! I’m a magpie too Patty! I need an intervention and I am determined to let it go! I love that you are donating your finds to the Center for Refugee Services – so you can still have the thrill of the hunt without all the stuff! Hi Kelly and Happy New Year, I’ve already started my decluttering adventure the day after Christmas. Where does all of this stuff come from. So yes, I am joining you on this adventure. “Too Much Stuff” is starting to make me nervous….UGH. Part of my decluttering is also organizing what I want to keep so it’s going to be a long process. If you saw my master closet you would fall over. Good luck to everyone with this challenge!! I hear you Marianne! My closet is always a work in progress. Why do I keep stuff I can’t fit into or haven’t worn in years? I’m in but I have one question — what size bag are we talking about? …plastic WalMart bag or Hefty 26 gallon size? Hmm, this could get interesting. Any size! I just filled up a sandwich bag of old jewelry! Just depends what area you’re working on Sheila! Ok, I’m in. Going to start on my art room. Too much clutter in there! True story…..best friend asked me to come spend a week at her mom’s old house cleaning it out. Mom had moved to a small four room rent house a few years back. Mom’s old house was a small six room plus bathroom house. My friend’s mom was a hoarder. We quit counting after we reached 250 black garbage bags. Seven days in, we could see most of the floors in each room. We left the attic for my friend’s brother to tackle. It was an unforgettable experience (understatement!). The entire eight hour drive home was a come-to-jesus meeting with myself as I accepted the fact that I was a younger and not yet as cluttered version of my best friends mom. I got home and immediately began decluttering. It’s hard. I have a Great Depression mentality…..what if I need it, what if someone else needs it, it’s still in good shape, it could be fixed, it would be wasteful to throw it away. Then Hurricane Katrina hit and devastated areas near us and suddenly I had a reason to let go of things that I’d been waffling over. There were people in need of everything. Daughter and I loaded up truckloads of everything from furniture to clothes to linens to small kitchen appliances. I’ve still got a ways to go but I’m getting there. I sort and purge about once every six months. Then six months later I’ll go through everything again and find that, in the interim, things that I thought I couldn’t let go of had loosened their hold on me. I’ve reduced what I bring into my home by about 90%. If you don’t go to stores where there are tempting things, tings don’t find their way into the house…..amazing isn’t it? Lol! COUNT ME IN!!! I’m at the age where if I wake up in the middle of the night….the CLUTTER TERRORS start to haunt me! lol! =) I keep finding myself yelling to my husband when the doorbell rings…”don’t let anybody in here!”….now that says TIME TO DECLUTTER AND ORGANIZE! Happy New Year to all and happy decluttering! Thanks for the inspiration, Kelly! Count me in Kelly. Me and my husband recently moved into a bigger house and we are expecting our first child. So we have been slowly getting rid of things while moving stuff into the new house. But honestly we could get rid of lots more. My husband is the collector hoarder in our home and at 9 months pregnant and due anytime, I want to just throw out everything and start fresh. (unfortunately he does not feel the same!) But after moving a bunch of stuff today he said:” I really need to let stuff go.” So hopefully he will be more on board soon. Thanks for the challenge and HAPPY NEW YEAR!